Pour the stock into a large saucepan and bring to boil.Meanwhile, peel and chop the pumpkin into small chunks and roughly chop the onion and garlic. If the stock boils before you are finished, just reduce the heat to a simmer.Transfer the pumpkin, onion, and garlic to the stock, adding ½ cup to 1 cup of water so that the pumpkin is just covered with liquid. Add the curry powder, cumin and coriander and stir. Bring the saucepan back to boil, then reduce to a simmer. 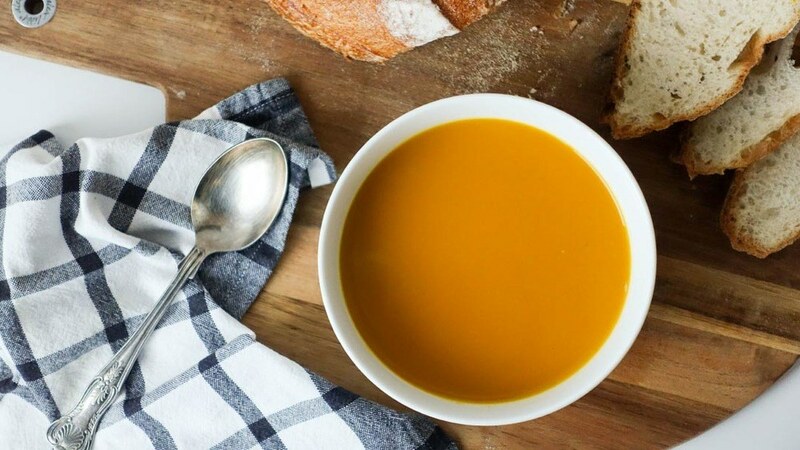 Cook with the lid on for 10 minutes, or until the pumpkin is soft, stirring occasionally.Remove from heat, and puree with a stick blender (if you don’t have a stick blender, use an ordinary food processor and blend in batches instead). Once the mixture is pureed stir through the coconut milk.Divide between bowls and serve with a slice of thick crusty bread.